Happy Mani Monday, guys! Over the last few weeks during my sickness I have painted my nails at least seven different times. I ruined every single manicure with blanket marks, though. One of the downfalls of mono is that you sleep ALL THE TIME so I think every time I did my nails I would fall asleep within an hour of doing them, and smudge everything, lol! 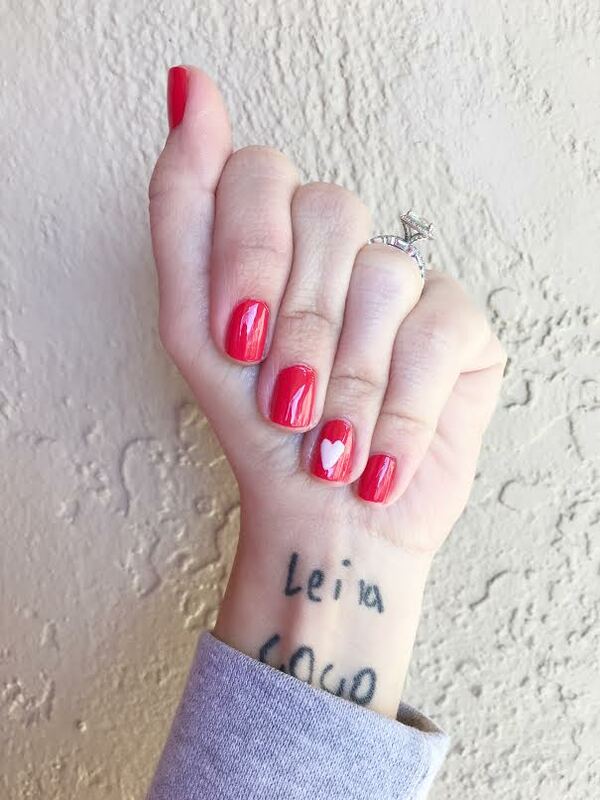 I am feeling much better now though, and did my nails without ruining them :) The main color is 5 Apples Tall from the Hello Kitty for OPI collection - it is this really gorgeous *almost* red. It's kind of a cross between an orange and a hot pink and a red. It is great! Then I free handed a little heart with Let's Be Friends from the same collection. That might actually be my favorite color from the whole collection - it's this really pretty, pale milky pink. What are YOU rocking on your nails right now? And have you picked up any of the new Hello Kitty for OPI collection yet? If so, what's your favorite? ?